Giving you direct, instant access to more options so you can get what you need, when you need it. Join Now, It's Free!Need More? Watch this! Created for researchers, healthcare providers, labs, manufacturers, service providers, and others in the life sciences industries, BioMarketplace offers a fresh way to obtain the biological and technological products and services you need. Here, online procurement is secure, easy and much more convenient than traditional sourcing. With features like comparison shopping, price bidding, and direct messaging between members and partner vendors, you’re sure to find exactly what you need, at a price you can live with. Join now for free! From biologics and medical devices, to lab services, analysis and development, compliance services, life sciences professional and consulting services, and much more, BioMarketplace is your one-stop-shop for just about everything BIO. For blood products, look no further than BioMarketplace. Our BIO Blood Exchange is the world's first open online source for blood products. Here, approved, certified healthcare providers, firms and researchers can quickly, easily, and conveniently shop for the blood supplies they need - from the readily available, to the rare and hard to find. Additional marketplaces, including Lab Services and Professional Services are currently operating in beta and are scheduled to open member-wide in 2016. You are a member if you are looking to shop for products and/or services. As a member, BioMarketplace brings you the kind of purchasing you've been dreaming about. You'll find qualified partner vendors offering amazing deals on biologics and more. Or use our future order tool and let partners bid for your business. Now is the time to ditch your old way of biologics sourcing and upgrade your experience and return with the new, modern way to order. You are a partner if you are looking for a way to market and sell your products and/or services. BioMarketplace brings you an online storefront unlike any other. By joining, you'll find a host of tools designed to help you expand your market reach, find new types of customers, build your brand, and grow your exposure and revenue. Join today and put researchers, healthcare providers, manufacturers, and more at your fingertips. BioMarketplace follows sourcing principals for the digital age, providing quick access to a large variety of products and services with just the click of a button. You'll never pay a membership fee to shop with us. BioMarketplace is supported by partnerships with life-science companies, who pay nominal transaction fees when you shop with them. Everyone wins. By design, BioMarketplace offers a way to supplement your already implemented GPO contracts, giving you access to additional product and service options. Comparison shopping, provider bidding, and direct messaging allow you to find exactly what you need at a price you can live with, and with access to the most accurate, information on the market. Our dual service account option allows you to purchase the things you need, and cut down on waste by selling your excess biologics before they expire. BioMarketplace is designed with you in mind. Our user-friendly interface makes it the easiest, most convenient way to find and procure biologics and services. Our game changing analytics suite makes it easy for you to track a wide variety of metrics including spending habits, broken down by individual, team, and organization; sales, trends, engagement, and more. 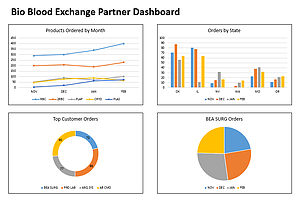 In addition, you are able to visualize your data using charts and graphs, to create dynamic reports.